(Nanowerk News) Rydberg atoms, atoms whose outermost electrons are highly excited but not ionized, might be just the thing for processing quantum information. 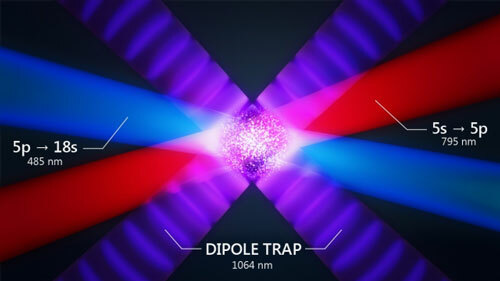 These outsized atoms can be sustained for a long time in a quantum superposition condition---a good thing for creating qubits---and they can interact strongly with other such atoms, making them useful for devising the kind of logic gates needed to process information. Scientists at Joint Quantum Institute (JQI) and at other labs are pursuing this promising research area. Fortunately, at just the right wavelengths, the “magic wavelengths,” the trapping process will confine atoms in both the low-lying n=5 state and in the excited n=18 state. The theoretical calculations predicting where these wavelengths would be (with a particularly useful one around a value of 1064 nm) and the experimental findings bearing out the predictions were published recently in the journal Physical Review A ("Magic wavelengths for the 5s–18s transition in rubidium").